The official Tom Daley Dive, challenges players to master the art of diving using timed touch screen gestures to twist, tuck and somersault their way into the global leader board. In beautifully rendered 3D, it is the first diving game offering a rich graphical experience to splash down on iPod touch, iPhone and iPad. Players will be able to enjoy the view as they perfect their dives in Olympic venues such as London, Barcelona and Beijing. 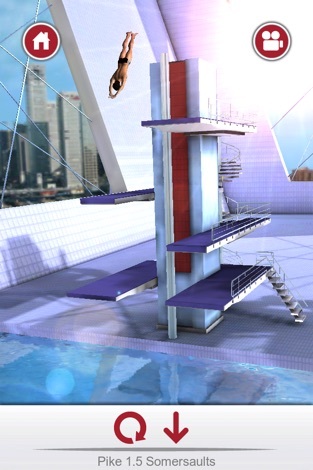 · Purchase the full range of dives to win gold in the Championships. · Choose from 6 different camera angles. · Replay your dives frame by frame to see where you went wrong and how to improve. · Have your score features on a global leader board. · Connect with your friends through Facebook, Twitter and Game Center. · Unlock exclusive Tom Daley images by completing in-game challenges.